The History for 2015 is currently writing itself. Click here to to follow the race, and see history happen. 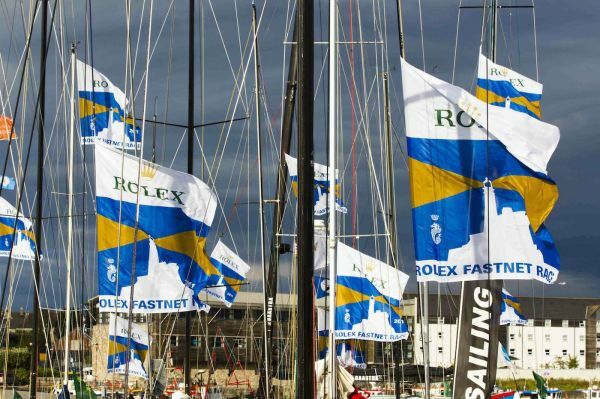 For the first time, RORC set an entry limit of 300 boats. Due to a severe weather warning from the UK Met Office, the start was delayed for a day – the first time in the race’s history. When the forcing numerous retirements, most doing so before leaving the English Channel. Of the starting fleet, less than a quarter finished the race. For those that stayed the course, there was fast sailing indeed: Mike Slade’s ICAP Leopard set a new monohull record of 1 day, 20 hours, and 18 mins at an average speed of 13.52 knots. George David’s Rambler also broke the previous record by some 8 hours. The Irish Cookson 50, Chieftain, won overall. In a series of seven starts from the Royal Yacht Squadron, staggered at intervals of 20 minutes, the 283-boat fleet got away in sparkling conditions - blazing sunshine but with a little less wind than most would have wanted. Nevertheless, the strong current was soon working in the fleets favour and propelling the fleet out of the Solent. Camera boats and spectator boats followed the fleet all the way to the Needles, with one yacht attracting a disproportionate level of interest. This was the old 1985 Maxi, Arnold Clark Drum, skippered by Simon Le Bon. Exactly 20 years earlier, the lead singer of Duran Duran had set out on this very same race in the very same boat. But he never got to see the Fastnet Rock that year. Battling through storm-force winds near Falmouth, Drum's keel wrenched away from the hull and the Maxi capsized. Le Bon and crew were rescued by the RNLI. Twenty years later, the crew had got back together, this time determined to see that elusive Rock. The 245 strong fleet, split into seven classes, started in a 12 knot Easterly winds and a building West going tide in the Solent. These conditions resulted in a downwind start, the entire fleet setting spinnakers for the run West down the Solent. Ecover led away the Open 60's, whilst in Super Zero Charles Dunstone's Nokia had the lead start in a class that included the glamour boats, Neville Crichton's Alfa Romeo and Robert McNeil's Zephyrus V. Class Zero started with the 2001 winner, Piet Vroon's Tonnerre de Breskens first across the start whilst the majority of the fleet in Classes 1, 2 and 3 had to fight to find space. The multihull start ranged from 40 foot trimarans to Tony Bullimore's 100 catamaran Team Pimsic. Alfa Romeo rounded the Fastnet Rock on Monday at 00:37 followed an hour later by Zephyrus V. The first multihull, Team Pimsic rounded the Fastnet Rock at 11:25 on Tuesday morning. 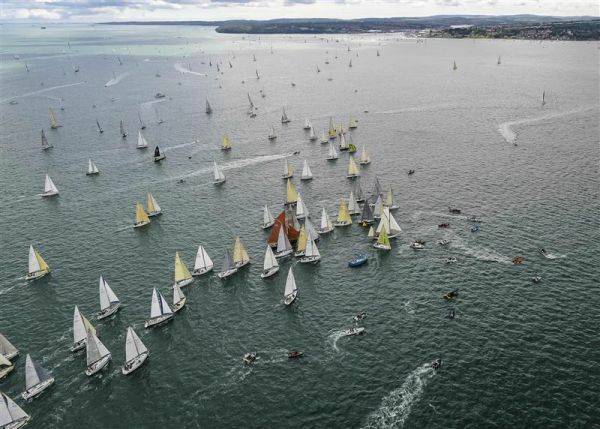 Consolidating on their breakaway tactics around Portland Bill at the beginning of the race, Jazz followed Tonnerre de Bresken around the Fastnet Rock just 60 minutes later on Tuesday morning, the smaller boat correcting out to lead by more than 2 hours at this point. 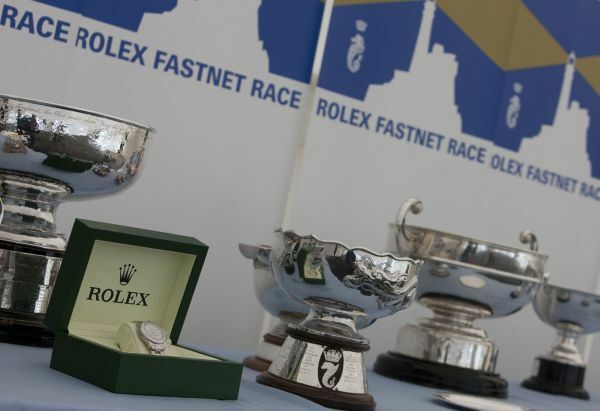 The 2001 Rolex Fastnet attracted 229 yachts from over 9 countries to take part, including several world famous yachts including Giovanni Agnelli's Frers One-off Stealth and Ludde Ingvall's Nicorette. 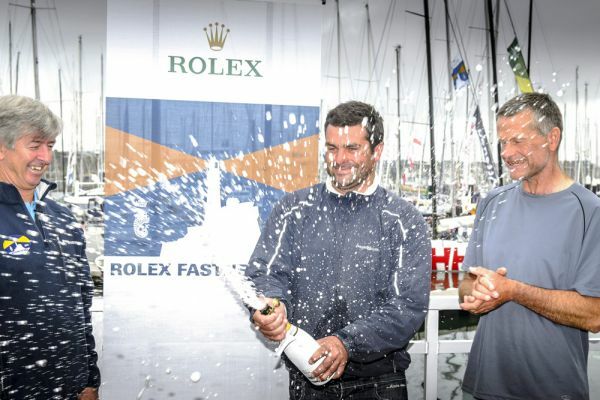 The winner of the Fastnet Challenge Cup, for Best Overall in IRC was Piet Vroon from Holland, racing his Lutra 52, Tonnerre de Breskens. Piet took 3 days 02hrs 23mins and 31secs to complete the course, winning it for the first time in 20 attempts. The excitement of the start was heightened by 28 knots of wind and square beating conditions. A decent breeze prevailed to enable some boats to stay offshore at Portland Bill. However, the fleet split and the front of the fleet experienced totally different weather patterns to the middle and back markers.